A post by Helen Blanchett with contributions by Luigi Galimberti (Tate). Thanks also to Professor Maria Delgado (Royal Central School of Speech and Drama, University of London), Dr Miranda Barnes (Bath Spa University, Mark Lester (Cardiff Metropolitan University and Dr Tamsin Burland (Jisc) for their notes. We’ve created a Wakelet containing tweets from the day – many thanks to those who tweeted, in particular Prof Deborah Sugg Ryan. Slide and links to recordings are in the text below. A PDF programme with links to resources is also available. 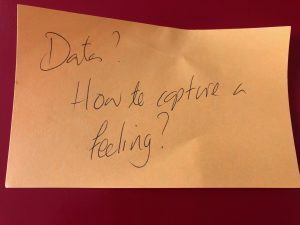 We hosted a community event on Capturing practice research: improving visibility and searchability in London on 15th March. 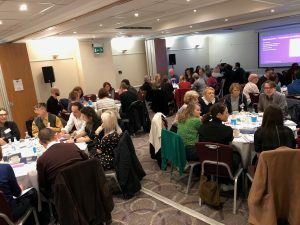 The event brought together discussions that were happening across the sector, in the repository community and amongst researchers and research managers. The workshop was developed in collaboration with PRAG-UK, ARMA and members of the repository community. With over 80 attendees and a long waiting list, the event was hugely oversubscribed indicating the interest in this topic. The day started with a welcome and introduction to the day, followed by a summary of Jisc’s work supporting repository development in general, and for arts in particular (projects such as Kultur, Kaptur, Kultivate, Defiant Objects and eNova.). Our current focus is to support sharing of best practice and to gather requirements for the development of our open research hub. [Slides] [Recording]. 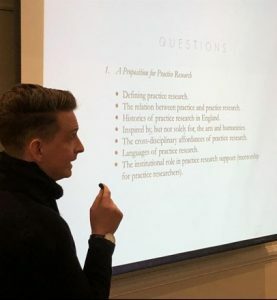 No clear definition of practice research – there is a lack of definition as to what constitutes practice research, and a confusion between practice and practice research. There is a need to question ‘where/what is the research?’ at all times. A lack of diversity in the policy landscape – some felt only ‘lipservice’ was paid to practice research in policy documents. REF guidelines do not fit multi-format, multidisciplinary practice research and REF categories don’t always align with object types and research categories. The ‘REF graveyard’ – there is a tension between CRIS/repository systems being used as both a showcase and for REF submission. Long-term preservation and discoverability wasn’t a priority. As one presenter said, “practice based research (indeed all research) is for life not just for the REF”. 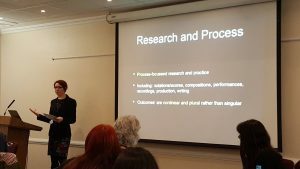 Form and nature of practice research – there are issues defining the ‘output’ , when practice research often involves ‘living works’ which are changing and evolving. Also, how do you capture the richness of practice research, for example performances and emotion? How can practice research be documented, preserved, contextualised and shared? As well as defining what to document, we need to think about timing – capturing the process and not just the end result. 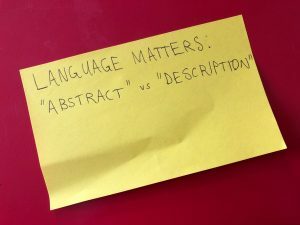 Systems, standards and metadata – many issues emerged from systems that were built on a ‘science model’ and text-based outputs such as PDFs, resulting in an overuse of the ‘other’ item. There are also challenges of format, in that systems often not geared for large multimedia files. Web sites are often a preferred format capturing the ‘essence of a project’- how can these be documented/represented in a repository and preserved? The language used within systems is geared for text documents and is off-putting e.g. upload ‘document’, ‘abstract’ rather than ‘file’ or ‘description’. Support for researchers – in terms of identifying what is the research, what to capture and how best to do this. There are concerns about the additional time to do this and impact on workload. The complex and unique nature of each person’s research means that more support is required throughout the whole process of research and a more in-depth conversation needs to take place between the researcher and research support professionals. Copyright – policy requirements may not match the needs of practice researchers, who may wish to have more control over their outputs than STEM researchers. There is also a need for support in understanding licensing options. After a brief mention of Goldsmiths repository, Tracy introduced the work of PRAG-UK, which is a research community established with the aim to increase the visibility and accessibility of UK practice research and its impact, and to make this research more searchable internationally. PRAG-UK has also a focus on the curation of practice research output and on how to frame portfolios. Tracy said that much of the research in arts and humanities (she referred in particular to architecture and design) is currently invisible to governments and funders. Researchers James Bulley and Ozden Sahin, also of Goldsmiths, are currently working on two reports, which are going to be published in June 2019. The first report, A Proposition for Practice Research, will focus on: defining practice research; the relation between practice and practice research; histories of practice research in England; the cross-disciplinary affordances; languages; the institutional role in practice research support (mentoring for researchers). The second report, The Form of Practice Research, will focus on: the types of outputs; technologies for capture and presentation; metadata standards and identifiers; peer review; preservation and visibility in 10, 20 and 100 years. Stephanie presented UAL’s repository, which was built as part of the Jisc-funded Kultur project, and, when launched in February 2010, was the first repository specifically designed for research in creative arts design and media. Stephanie mentioned that the under-investment that is currently affecting the arts and humanities also comes from the invisibility of much of the research that is conducted in this sector, echoing previous comments. She also highlighted a few challenges: most of the items deposited in UAL’s repository are PhD theses and journal articles, because it is an obligation for both doctoral candidates and staff members to do so; however, all other types of output are not enough represented, because researchers generally tend not to self-archive their work. A key point is for researchers to understand how to document practice-based research. Another issue is that repositories were initially developed as a way to deposit research and make it accessible to the public, and not as a tool to manage research (e.g. for the REF submission). Christie presented the work of ARMA, which is the professional association for research management in the UK, with over 3,000 members. The arts and humanities special interest group champion of ARMA is ready to support institutions on how to archive and document practice-based research. However, Christie said that the fact that there is not a standard definition of practice-based research is a challenge for the researchers as well as for the people supporting them. On top of this, the current policy landscape still focuses on traditional research outputs (e.g. journal articles), particularly in the context of the REF. 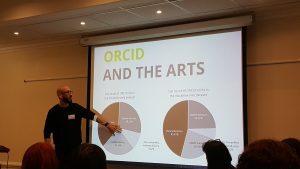 ORCID is the organisation that manages the ORCID ID (Open Researcher and Contributor ID), which is a unique, permanent identifier for scientific and other academic authors and contributors. It emerged that while arts researchers are over-represented in numbers having an ID, they are attaching fewer works to their IDs than other disciplines. Josh said that a key point of the ORCID system is that also researchers outside the academia can have an ORCID ID. He also mentioned that a new form of ID for projects, called RAiD (Research Activity ID), which works as a project identifier, is currently being developed. This can be useful when a series of elements (individual researchers with ORCIDs, journal articles with DOIs, websites etc.) need to be presented together, because they are part of single research activity (also for auditing purposes). RAiD will allow automated access and reuse, will have handles and can be retrieved by APIs. Lauren is a composer and performer of music. She started citing the work of Ben Spatz (What a Body Can Do: Technique as Knowledge, Practice as Research. Routledge, London and New York, 2015), who wrote that the transmission of knowledge in the form of technique can be seen as the primary activity of research practitioners. Lauren has developed a portfolio format for practice research, which is compatible with REF guidelines (portfolio as a research document, which is separate from the researcher’s own practice). In her case, the portfolio is made of a 300-word research statement, project research questions, two albums (audio), example of a performance lecture, examples of score material, timeline of performance history, article/exegesis (theory) and appendix of selected bibliography and webography. According to her, the portfolio should be complete in and of itself, should be open access and should address multiple audiences. Such portfolio would be able to include research outputs that are nonlinear and plural. She stressed that documenting research should start from the beginning and that it can be different from the outcome of the research itself. Jenny mentioned their new institutional repository, which has a built-in function that allows the creation portfolios (i.e. a collection of items). The University of Westminster is now building a preservation system on top of the repository. Athanasios presented Artivity, an app that enables the documentation, analysis, archiving and preservation of digitally produced artwork. Artists that work digitally with Photoshop, Illustrator, Inkscapes, Krita or even Google Chrome, could have their activity recorded (in the background, via the app) and analysed as part of the research. The app is able to analyse the technique and style of digital artworks. What happens to the digital object, i.e. the event, is what needs to be documented. Artivity also produces information (data and visual) that could be then reused by artists in their own work. Athanasios is also working on Nepomuk, a piece of software that documents the interaction between users and computers. Nepomuk has been built using PROV, a provenance standard for web information, developed by the World Wide Web Consortium, and it will work with every type of research work. 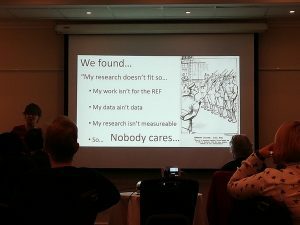 Helen highlighted that only 3% of all the research outputs deposited into the institutional repository is something other than a journal article, a book (or book chapter) or a conference paper (or poster). In order to tackle this, she developed a communication strategy around the repository (e.g. a service statement) that tries to answer the questions and doubts of practice-based researchers, particularly in the arts, that usually do not see the institutional repositories as a place where to put their own work. According to Helen, the question that should be kept in mind is what researchers in the future would like us to preserve. Helen stressed that practice-based research outputs need a context in order to be fully appreciated (e.g. file labels, captions). She added that viewers need to be guided as to what they are looking at, and that documentation is not an add-on, but it is an integral part of the research output. Miranda explained how Bath Spa University wanted to find a way to create open access portfolios in an electronic format. The main challenges were engaging with researchers, gathering materials and clearing for copyright and personal data permissions. Defining practice research. A first priority is to have more clarity over what practice research is, enabling researchers to identify their research (as opposed to practice!) more easily and allowing better communication around practice research. The current PRAG-UK research project should make progress towards this aim. Policy. There was a strong desire for clearer, more inclusive policy, especially from REF Panel 32 (Art and Design: History, Practice and Theory). It was hoped that the outcomes of the PRAG-UK projects can be taken forward into policy in some way. Researcher support engagement. There is a clear need for more support for researchers in how to document the process not just the output. A suggestion was made to look at parallels between creative process and ‘traditional’ research processes (eg description of methods, documenting processes) in order to engage researchers. Support was also suggested specifically for non-specialist universities to address the challenges they have around getting the needs of practice researchers getting heard and understood. Systems and design. There were many suggestions in this area. An observation from the day was that there were many similar but bespoke solutions and a suggestion was made to invest in sector-wide central funding to developing practice research and repositories. To address REF dominated repository issues, it was suggested that there is a need for templates, formats, models for visibility and searchability. We need to improve the use of language within systems to be more appropriate. We need to work on ensuring work is preserved beyond REF. A key point was that we must focus on the needs of the repository user in terms of discovery, whether this is research students or REF reviewers. As well as working on standards and sector-wider approaches, system users groups could work to address these issues with their providers. Sharing. At the end of a day full of discussion and conversation, the benefit of events such as this was acknowledged. Attendees expressed the wish for more sharing (not competing), or reinventing the wheel. Being able to see best practice examples from a range of institutions would be valuable. And while most of the discussion today focussed on the arts, there was a desire to extend the conversation beyond into other subjects where practice is relevant, such as medicine and health.